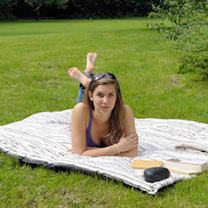 A real “all -rounder” outdoor blanket for relaxed outdoor reclining. Ideal for family picnics. With an insulated thermal lining made of 200g/m² hollow fibre, it is soft and warm. Extra strong coated underside makes it waterproof; topside 100% cotton flannel. Simply roll up and fasten the clip to easily carry. For a warm, waterproof cushion simply zip off the headpiece! Lying surface approximately 175cm x 135cm.